Jazz composers writing for large ensembles have often avoided the label "big band," going back to the Jazz Composer's Orchestra in the '60s, not to mention Sun Ra's Arkestra and the many Swing Era bands that called themselves orchestras. It's an understandable choice, given the unavoidableand potentially limitingstylistic associations that come with the big band name. 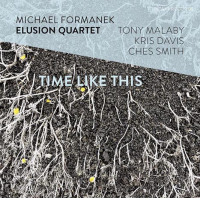 Bassist/composer Michael Formanek playfully calls this 18-piece group Ensemble Kolossus: it represents a bold creative leap forward from his previous quartet recordings Small Places (ECM, 2012) and The Rub and Spare Change (ECM, 2010). Formanek is no stranger to composing for large ensembles, having composed The Open Book for symphony orchestra with jazz soloists, which was premiered in 2007 at the Peabody Conservatory of Music in Baltimore, where he teaches jazz bass and jazz history, as well as directing the Peabody Jazz Orchestra. The centerpiece of this albumthe nine-part "Exoskeleton"runs for over an hour: an extended composition for an extended ensemble. Formanek says that he has never been interested in the traditional style of big-band writing, "because it's just been done so well so many times before." But opening track "The Distance" is a lyrical tone poem in traditional style, highlighting Brian Settles' solo tenor saxophone. Part I of "Exoskeleton" is full of thick, modernist dissonance. Part II gets back to tradition, in the form of a slow drag, featuring soloists Chris Speed (tenor saxophone) and Kirk Knuffke (cornet). Then it's on to sparse, atmospheric territory in Part III, featuring soloist Ben Gerstein (trombone). Back to swing on Part IV, with solos from Ralph Alessi (trumpet) and Alan Ferber (trombone). Guitarist Mary Halvorson had been using some electronic effects during her comping, but her solo on Part V really shows them off, with its tremolo and whammy pedal pitch-bending. Parts VI -VIII drive to the conclusion through the use of ostinato patterns. 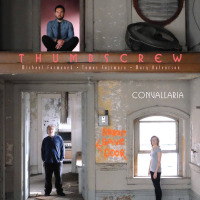 There are several soloists playing simultaneously on VI, while VII gives rhythm section members Patricia Brennan (marimba), Tomas Fujiwara (drums) and Kris Davis (piano) a chance to shine. Formanek's sense of humor shows again in the subtitles: "Shucking While Jiving" and "A Reptile Dysfunction." Part VIII is labeled as a collective improvisation by the full ensemble, but it nonetheless builds to a return of Part VI's ostinato. It's a big, colorful piece, full of stylistic variety. Dense ensemble sounds are balanced with sparser textures. 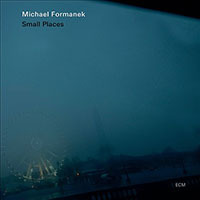 Formanek has a collection of very distinctive players to draw onincluding many of New York's busiest playersand since almost everyone gets at least one solo, their individual voices almost guarantee a certain kaleidoscopic character. Formanek chose to concentrate on playing bass as part of the rhythm section, so fellow bassist Mark Helias made an invaluable contribution as conductor. 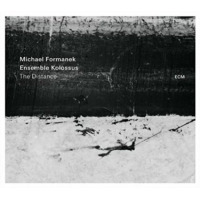 The Distance is a remarkable achievement, which Formanek's smaller ensembles have only hinted at.